Another food and beer pairing. This one perfect for those occasions where you want something wholesome, hearty, filling and warm. The casserole is simple. Take your favourite sausages (any will do) and brown them in a very hot pan, don't aim to cook them, you just need to colour the outside at this point. Remove the sausages and (in the same pan), sweat down some onions, celery, pepper and garlic. Add to this some passata, tomato puree, chunks of potato and some quartered and peeled tomatoes. Give it all a big stir, season and add the sausages back into the pot. Leave this to simmer for an hour with the lid on, and serve with a sprinkling of fresh coriander. Now for the beer. I love Brewdog 5am Saint. I first had it at the Brewdog tasting I wrote about here, and I've been a fan since. The beer is massive on the hop aroma and taste but lacks the big bitter finish you expect. It's so light, delicate and refreshing yet it doesn't disappoint on flavour. 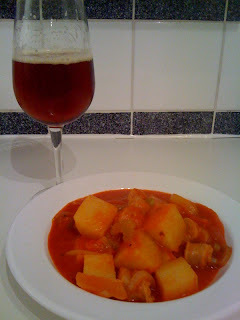 The big, juicy, fruity hop flavour in the beer is perfect for the rich, fruity tomato flavour in the casserole. The slight earthiness of the hop wraps itself around the meatiness of the sausages and then everything is picked up and swept away by the subtle bitterness of the beer's finish. The beer has enough hop flavour to ride above the casserole, but not so much that it over powers and numbs the palate. I've only included a quick summary of the recipe. It isn't massively complex, so there should be more than enough to go by. If anyone is interested, I can post a more detailed description with amounts. I'm tempted to order some 5am saint off the Brewdog website. Sounds like my kind of beer. I'm missing 'Chaos Theory'. That was simply incredible. Didn't get to try Chaos Theory, 5am Saint is great though. It's the postage that puts me off ordering from Brewdog. If you're only after a couple of bottles, £7 is a fair bit. I tend to leave it and chance it that Utobeer at Borough Market will get stuff.